Candy at the Cottagewood Store. Photo from Cottagewood Store Facebook page. Used with permission. The over 125 year old Cottagewood Store has a long and varied history. 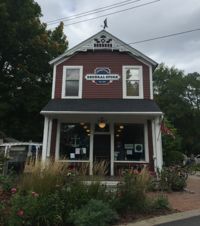 From its over 20 owners dating back to its construction in the late 1890s to the current ownership by the community, the Cottagewood Store has remained a staple to this small community nestled along Lake Minnetonka in the heart of Deephaven, Minnesota. In 1995, this community nearly lost this building to yet another new owner, but instead, the community came together to purchase the store. This community knew the feeling this heritage landmark created was worth saving. Most of the store’s 120 year history is documented in a book by one of its previous owners, Carl Soelberg, titled, “The Cottagewood Store; 1895 to 2000 and Beyond,” published in 2000. This community staple continues to stand the test of time and remains at the heart of the community of Cottagewood, Minnesota. The Cottagewood Store originally opened as a grocery store. The plot of land, lot 117, was purchased by Ralph and Stella Chapman in 1895 for a total of $500. Ralph owned and operated the store for nine years. It served not only the local community, but also the two popular hotels on Lake Minnetonka, the Hotel St. Louis and the Cottagewood Hotel, also known as the Keewaydin both of which burned down in later years. This area around Lake Minnetonka was known for its summer cottages. The front gabled, almost Stick style, store was built with living quarters above it that are still in use today. Not much is known about the products carried in Chapman’s Cottagewood Store. In the early years of operation, kerosene lamps would have lighted the store. Before 1900, Cottagewood was a part of the town of Excelsior, but in 1900, the town of Deephaven was incorporated. The Cottagewood Store was purchased in 1904 by Charles Sampson and was operated by his brother, Frank Sampson. An old 1904 telephone directory is referenced in Soleberg’s book, stating one could call the F.L. Sampson Groceries at Cottagewood Phone No. 61. The same year that electric streetcars were introduced in Deephaven in 1906, ownership of the store was transferred to Charles and Frank’s sister, Ella and her husband, William Loudon. Frank continued to operate it under the management of his sister and brother-in-law. Streetcar boats operated by Twin City Rapid Transit Line delivered vistiors to Cottagewood from towns around Lake Minnetonka. And by 1909, electricity had reached Deephaven. In 1910, ownership was sold to another family, Samuel and Rosa Reem, who renamed it Reem Grocery. According to accounts recorded by Soelberg, Samuel Reem died of a heart attack as a result of a quarrel with a customer about a box of snuff in 1911. The Cottagewood Store was also known for delivering groceries to those who called in orders. Using a horse and wagon, the Reems delivered groceries throughout Cottagewood. By the 1920s, a Model T pickup truck made the delivery of groceries by horse and wagon obsolete. Several owners lived in the apartment above the store. It is believed that an addition to the back was added to accommodate an owner with several young children in the late 1910s. Also around this time, new siding was added that covered the original shiplap. It is believed that the store was gray and white during the early 1910s. As more motor vehicles were introduced through the 1920s and 1930s, Cottagewood Avenue was paved in 1931. In 1938, people of Deephaven could purchase gas from the Cottagewood Store at the single pump outside, which remained in place until the 1990s. The store was closed during World War II between 1942 and 1944 and was sold in August 1944 to the Schoenle family from Excelsior. Their family of six lived in the upstairs apartment. During WWII, food was rationed, including ice cream. Also during the 1940s, the screen porch of the second floor apartment was enclosed. The store was sold yet again in 1946 and again in 1950, 1952, 1959, and 1969. In 1969, the gray store with white trim was painted gold and brown and a front porch canopy was added. It was sold again in 1971. Carl and Laura Soelberg bought the store in July 1971. Under the Soelbergs, the Cottagewood Store remained a grocery. Carl removed an earlier green fiberglass addition to the porch roof and shingled it. However, this was not approved by Deephaven’s Building Inspector, but according to Carl Soelberg, they weren’t fined and the inspector agreed to handle the matter over a Coke, some sweets and a conversation. In the summer of 1982, the Soelbergs sold the store to Roscoe Hackney. He installed new flooring, replaced old siding and painted it red, added insulation, and replaced the furnace. He also replaced the sign to say “Cottagewood General Store,” which marks the first time the store was referred to as a General Store. It was sold again in 1985 and 1990. During the early 1990s, the new owner installed the brick patio to the left of the front facade, and also created a commercial kitchen. In 1995, the store was for sale yet again. This time was different. A neighborhood meeting was called to discuss plans for the neighborhood to possibly purchase the property. Though the day of the meeting, a water pipe had frozen and burst leaving nearly two feet of water in the basement. Over 100 people attended the meeting, overcrowding the main floor so that Harry Allen, the organizer of the meeting, historical director of Deephaven at the time and future President of the Cottagewood Store Steering Committee, had to stand on the counter. Soon fundraising had started. The steering committee raised funds nearing $50,000 from around 25 families, but the work had to continue. The asking price was nearly $165,000. An LLC was established on May 24, 1995, establishing a system of shares to be sold for five hundred dollars each between May 1995 and April 1996. According to city records, 63% of funds were raised by October 27th, 1995, including 120 families who had either invested in the store or contributed. A conditional use permit issued by the city of Deephaven had threatened closing the store if it did not remain operable. All of the funds were raised by the end of December, but it had to reopen by January 10th, 1996, in order to remain in business according to the conditional use permit. With help from the local Cub Foods store in Minnetonka and several others, who were heavily involved in fundraising, the store reopened on January 7th, 1996. A board of directors was selected that year, as well as a new store operator. However, after only one year the store operator left and the store was closed from January through June 1997. In 1998, a fundraising effort led to the development of the Cottagewood Children’s Park next to the store. Play structures were dedicated and a small bronze sculpture flanked on all sides by quotes celebrating childhood and innocence were installed. Three children were remembered at the park dedication, but it was noted that the park should celebrate the other children of the neighborhood as well and create a safe place for them to play. That same year, the front terrace of the Cottagewood Store was re-bricked with stamped bricks of the original shareholders from 1995. Later in 1998, the LLC applied for 501C3 status, which was later granted in 1999. The Cottagewood Community Foundation was then created as a non-profit and has since managed the operations of the business. Numerous events occur throughout their open season from May through October. 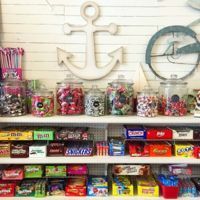 Throughout its history, whether it was a general store or a grocery store, parents and kids alike from the neighborhood have and still do buy candy, soda pop, snacks and treats there. Combing through Deephaven city records, the value this place has added to this community has become clear. A quote from two influential families, the Monsons and the Allens, involved in its revitalization in the late 1990s, states, “The General Store is a treasure in our neighborhood with great historic value.” It is a living, breathing building that has continued to serve its community. Whether it was a grocery store, a gathering place for coffee, a place to pick up a forgotten carton of milk, or a bus stop for local kids, the Cottagewood Store remains a vital part of this community’s identity. Laurie Jenkins, the Cottagewood Store Manager and Board Executive Director of the Cottagewood Community Foundation, grew up in the Minnetonka area. She has been working for the store for the last 10 years. She notes that “everything in the store is crooked” making hanging anything on the wall an exercise in futility. The upstairs apartment is still in use as a rental property and helps offset some of the operating costs. The Cottagewood Store is only open from May through October every year. The store hosts grill nights every Friday, a Fourth of July celebration, lawn sales in the spring and fall, Halloween tricks and treats and even opens for a few days around Christmas. Laurie notes that she makes an effort to hire high school aged kids from the surrounding Minnetonka area to work at the store, sometimes it is even their first job. She sees the store being more inclusive to the broader community of Minnetonka, rather than just to Cottagewood. Laurie says that one of her favorite parts of opening the store in May is seeing how much the kids have grown over the winter. A school bus stop remains out front. Families have been able to set up charge accounts, even when the Cottagewood Store was a grocery store, and still can today. This allows community kids to pick up a candy on the way home without having to carry change. However, some children will bring $10 in allowance money to open their own charge account giving them an early lesson in finance. The store even has a group of morning regulars, the “coffee ladies.” They come in every week for coffee and conversation. Laurie noted that the 2016 election season has provided some colorful discussions. As you approach the store and see it hugging the street, framed by the sky and tall trees, you can almost feel a gentle tug backward in time - 70 - 80 - 90 years! What you see is a full-size, three-dimensional Norman Rockwell magazine cover from another era. How did this thing ever survive all these years? Most haven’t. They were killed off by “progress.” This one survived because it continued to serve a modest purpose long enough for the community to recognize it had a unique heritage landmark that had to be rescued from the fate of all the rest. Luckily, this store crossed the time threshold into an era when people are aware of and appreciate things from our past… The residents of Cottagewood had something they did not want to lose because they knew it could never be replaced. Carl Soelberg, The Cottagewood Store: 1895 to 2000 and Beyond, (Minneapolis: Skyway Publications, Inc, 2000), 30. Carl Soelberg's quote from his book describing his sentiments about the store are reflected in the faces and attitudes of those who visit even today. Whether it be during their 4th of July celebration, Halloween or grabbing a morning coffee, the community of Cottagewood is preserving a vital part of their heritage by keeping this store operable and maintaining this gathering place for future generations. All Hallows' Eve at the Cottagewood Store and the surrounding Cottagewood neighborhood is crawling with children and families. At 6:15pm, one can’t drive more than 10 miles an hour for fear a young costumed child may come running through the bushes into the street. Almost all of the houses surrounding the store and Cottagewood Children’s Park have lights on, pumpkins on the front step and some even have music playing. The sign on the front door to the Cottagewood Store says closed, as it's the last day of the season, but the lights are on and the door is wide open. Candy is brimming from the glass display case close to the door. Lines of kids file in with their parents to get a handful of candy. Squeals of excitement can be heard from down Cottagewood Avenue. A small costumed policeman is leaning up against the candy counter eyeing the chocolates and leaves the store with a jack-o-lantern basket that is just a little bit fuller. A small werewolf howls on its way out of the store. A young Wayne Gretzky fills his bag with goodies. To say the streets and sidewalks are packed with families is an understatement. The store is a beacon of joy and excitement on this dreary and rainy night. Parents say hi to other children they know entering the store and comment on the fabulous costumes worn by all. Kids wander in without parents and are welcomed with open arms and greeted by their first names. The store staff knows nearly every family filing in the door and asks how each family is doing. Hugs are shared between parents and kids. Two storm troopers, mom and son, wielding light sabers enter the store past me. As I exit the store, a little skunk hops off her father’s shoulders and squeaks as she runs in. The drizzle hasn't stopped people from stopping by, but it has slowed some foot traffic. High school students work behind the counter with Laurie. Though the building does have a stop sign out front, there is some traffic that passes by. As a princess comes running down the sidewalk, cars slow down to make sure the two sumo wrestlers nearing the store don't get hit. Sidewalks line Cottagewood Avenue, but side roads go without. The number of kids entering the store must number in the hundreds tonight, comparing the amount of candy they’ve received as they leave. Parents huddle in groups holding cups of hot cocoa on the sidewalk. This experience is like being in a Halloween movie. Themed Halloween music can be heard across the park with the faint screams of young children. Haunting organ music emanates from up a small hill at the north east edge of the park, no more than 500 feet from the store. The misting rain and whistling wind creates an atmosphere like those in Hollywood movies about Halloween. It's almost as if I was waiting for the Sanderson Sisters, from Disney’s Hocus Pocus, to come skulking down the street, broomsticks in hand. This research would not have been possible without the help of Laurie Jenkins at the Cottagewood Store and Lisa Stevens at the Excelsior-Lake Minnetonka Historical Society. City of Deephaven building and zoning records. Numerous news clippings from the archives at the Excelsior-Lake Minnetonka Historical Society. Soelberg, Carl. The Cottagewood Store: 1895 to 2000 and Beyond. Minneapolis: Skyway Publications, Inc, 2000. This page was last modified on November 6, 2016, at 22:30. This page has been accessed 26,702 times.